You have heard the phrase over and over, “It fails to grade, but it makes good delivery!” What does this mean? PACA uses these guidelines to determine if a load of produce meets “Suitable Shipping Condition,” a requirement for shippers to meet their contractual agreements. First let’s clarify the ground rules. Good delivery applies to FOB Sales only, meaning the buyer takes title at shipping point for a product he/she has not seen. The buyer may reject or claim damages chargeable to the shipper, only if it can be shown the product was not in suitable shipping condition when title passed at shipping point. In other words, this warranty requires the shipper to place the product “free from on board” (FOB) so that it will make good delivery. A couple of other points are very important. a) The Good Delivery Tolerances or Guidelines only apply to condition defects, if no grade is specified in a contract. b) And there must be no transportation problems. Transportation problems will result in claims instituted by the buyer against the trucking company, or railroad. Example 1, Cucumbers are inspected and found to contain 33% quality defects, misshapen and scars and 12% damage by shriveled ends. This lot would fail to grade U.S. No.1, but it would meet good delivery tolerances of 15% total (condition) defects, if no grade was specified. Example 2, Romaine is found to contain 11% damage by yellow to black discolored leaves, and 4% decay. This lot would also fail to grade U.S. No.1, but would meet the good delivery tolerances of 15% total defects, including 4% decay. Example 3, Strawberries are found to contain 16% damage by bruising and 5% decay. This lot would fail to grade U.S. No.1 and fail to meet the good delivery tolerances of 15% total defects and 3% decay. Example 4, Peaches are found with arrival temperature of 50°F, with a delay in delivery. The peaches have 20% damage by bruising and 8% decay. The good delivery tolerances are 17% total defects, including 4% for decay. The shipper’s warranty of suitable shipping condition and good delivery guidelines are not applicable. The buyer holds the transportation claim. For a complete list of Good Delivery Guidelines, go to the Inspection Guidelines page. Remember, these tolerances are only guides and not final authority. You should contact your local PACA office for an official determination of your rights and responsibilities. Great post. The good delivery tolerances have been like dark secrets, no one would ever let us know when inspected lots met or failed to meet good delivery. And since quality defects are not counted in good delivery, there really is no reason of paying extra money for quality and condition inspections. This is very helpful. Aside from normal good delivery tolerances, sometimes PACA will add extras, depending on growing problems. 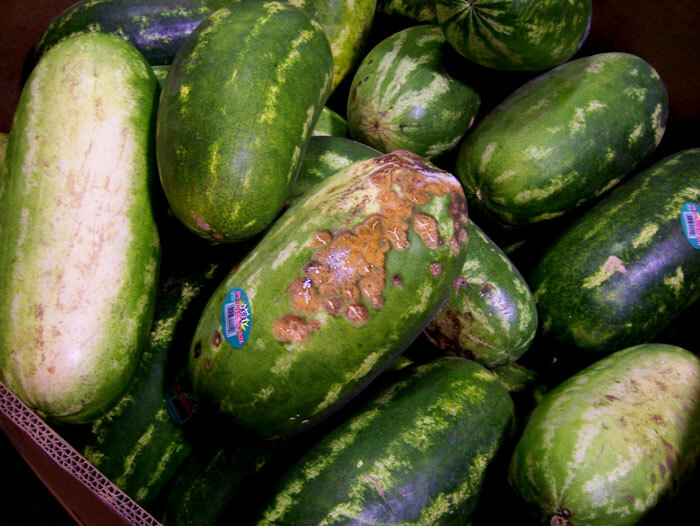 For the most part “discoloration following bruising” on lettuce is never considered a defect. Sometimes the discoloration from field freezing isn’t counted either. The defects still affect the U.S. No.1 Grade, and the certificate will indicate the lot fails to grade, but in reality the lot makes good delivery. I am aware of other instances where shippers place their own exclusions in their contracts; for example some shippers do not recognize “abnormal coloring” as a defect on tomatoes. Bottom line, don’t assume a “fails to grade” statement on a USDA certificate means the lot “fails good delivery”…and don’t assume that some defects are even counted as defects, as far as PACA and good delivery is concerned. All very confusing.